Has anyone here been to the Dr Who experience? How was it? And yes, I completely agree with this. A bit apathetic about the news at the moment. With me, I was much more excited about Doctor Who when David Tennant was the Doctor, as I prefer him much more than Matt Smith's version as he had much more energy and was much cooler. Yes. Pretty good. More aimed at children, but still good. When a Weeping Angel suddenly appears silently out of the dark it takes a good few moments for your head to go "oh, hang on, that's a stage prop". Thats because they knew kids had short attention spans so needed stuff to be in your face. DT also felt like that annoying uncle who was trying to be cool with kids so hammed it up and was embaressing. Re the wait for the rest of this series of Doctor Who. If there wasn't a break we'd only have 2 more episodes left to watch at this stage. But instead, we now have 6 more to look forward too. I'm enjoying the Matt Smith episodes quite a lot. I feel he's adding something to it like all the previous actors have done. Tennant was far more charismatic but I was frustrated throughout his time because of everyone falling in love with him (barring Donna). I like this whole self discovery path that Matt Smith's doctor is going down, and that's including finding himself with the whole River situation. Clearly River/ Melody will be someone he will be protective and caring of throughout her entire life, what with her being Amy's daughter and him knowing who she will turn into. Okay then. I will plan to see it this summer. I was debating whether I should as it's a bit off the centre of London, and I wasn't sure if it was a bit gimmicky... Thanks for your help! Oh, hang on, you're talking about something else... I thought you meant the live interactive play that's on in Manchester right now, not some glorified museum. No, I was speaking of the glorified museum at the Olympia. What were you talking about? I was interested in DT's as he had loads of quirks and his catchphrases e.g "Allons-y" were great in my eyes. I enjoyed him, not for the explosions and stuff (which he did the stunts like in the Lazarus Experiment with the explosion, which he made look even cooler) , but because DT is an amazing actor and so his range of emotions were a lot and so he could suddenly turn from angry to happy very quickly. I didn't really like that for the majority of DT's tenure, it was about him carrying the guilt from the Time War and all that, and I think if he was the 11th, and so the bits about the guilt would have been before, it would have been a good thing, and a bad thing. Good, as then he could act more emotions and also you could see him do something and then feel the guilt so it would be a type of journey instead of him carrying it from something off-screen. It would have been bad as the sudden guilt from something happening or nothing like that happening would have restricted the emotions DT could have conveyed. He may have shouted, but in the situations he was put in, it was for good reason. What do you mean we would only have 2 more episodes, we'd have 6 anyway cos it's normally a 13-episode series, and the first half was 7. I do think Matt Smith is a good Doctor, but I prefer Tennant more. It is true that it got frustrating that everyone fancied him, and that's why I loved Series 4, due to the matey relationship he had with Donna (I loved the whole banter between them and Donna constantly calling him skinny and others). I agree that as the Doctor now knows about River/Melody and that he knows who she is and will be that he will protect her and that's probably why he'll be there for her when she's young and so that would start their whole relationship (whether it be platonic, or a romantic one) so it's kind of a paradox isn't it? I meant that if there wasn't a hiatus we'd only have 2 more episodes left at this point in time because it won't have stopped airing. Oh sorry, I must have read what you said your wrong. <- Lol it rhymes, mostly. Now... I'm used to seeing John Barrowman's airbrushed/heavily plastered face... but Eve doesn't look like herself :| It's partly the hair (her forehead looks ridiculous in the picture) and partly the airbrushed-smooth skin... but yeah... ridiculous. 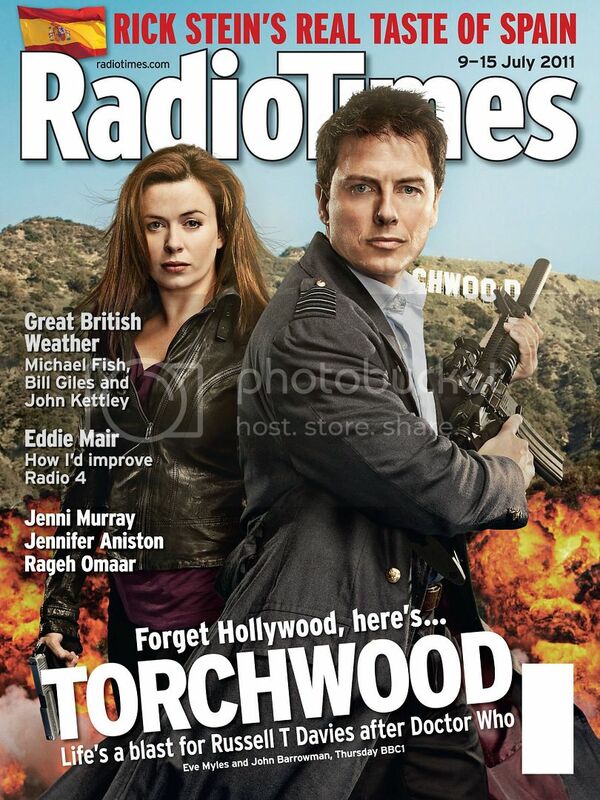 Am I the only one who thinks it looks like John Barrowman's face has been photoshopped onto his own body at a really weird angle? I think her hair colour/ lipsitck and eyemakeup also have something to do with it. defiantly not her normal makeup look. I have fallen out of love with John Barrowman - Botox much? !